We handle all types of felony, misdemeanor, and VOP cases in Saint Johns County. We provide free consultations and accept payment plans. Travis Mydock, B.C.S. is a board certified expert and specialist in criminal trial law as recognized by The Florida Bar. 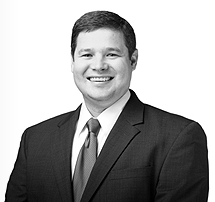 He is also a former prosecutor in the 7th Judicial Circuit (Saint Johns, Flagler, Putnam, and Volusia counties). I am a board certified expert and specialist in criminal trial law as recognized by The Florida Bar. Less than 1% of all attorneys in Florida hold this distinction. My prior experience includes over 2,000 criminal cases and 40 criminal trials completed to verdict. I am a former felony, misdemeanor, and DUI prosecutor in Saint Johns County. I also previously served as the drug trafficking prosecutor while at the State Attorney's Office. I now defend all types of felony, misdemeanor and VOP cases. I've represented first offenders, habitual felony offenders, and prison releasee reoffenders. I've defended minor cases like possession of cannabis, domestic battery, petit theft, and DUI. I've also defended major cases like drug trafficking, aggravated battery, robbery with a firearm, and DUI manslaughter. I provide honest and straightforward legal advice that you can trust. Call or text me at (904) 494-8402 for a free and confidential consultation about your case. 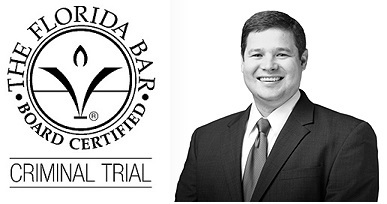 I am a board certified expert and specialist in criminal trial law as recognized by The Florida Bar. Less than 1% of all attorneys in Florida hold this distinction. I am also a former felony, misdemeanor, and VOP prosecutor in Saint Johns County. I've handled over 2,000 criminal cases and 40 criminal trials completed to verdict. I've defended (and prosecuted) cases from DUI (1st offense) to DUI manslaughter. I graduated from the University of Florida. I earned a finance degree in 2006 and a law degree in 2009. I maintain a perfect 10 attorney rating on AVVO. I am always accessible to my clients. Each client has my personal cell phone and email so that they can reach me in times of need. I provide free consultations and accept payment plans. I am a board certified expert and specialist in criminal trial law as recognized by The Florida Bar. My practice is limited to DUI and criminal defense. I handle all types of felony, misdemeanor, and VOP cases. My office is in Saint Augustine, but I handle cases statewide. I am a former felony, misdemeanor, and DUI prosecutor in the 7th Judicial Circuit (St. Johns, Flagler, Volusia, and Putnam counties). My firm offers competitive prices and accepts payment plans. Each client has my cell phone number so that they can reach me anytime 24/7. Call 904-494-8402 for a free and confidential consultation.